For over 250 years, ukiyo-e, a distinct style of Japanese art that depicted contemporary life, flourished in Japan and came to define the island nation's artistic aesthetic. 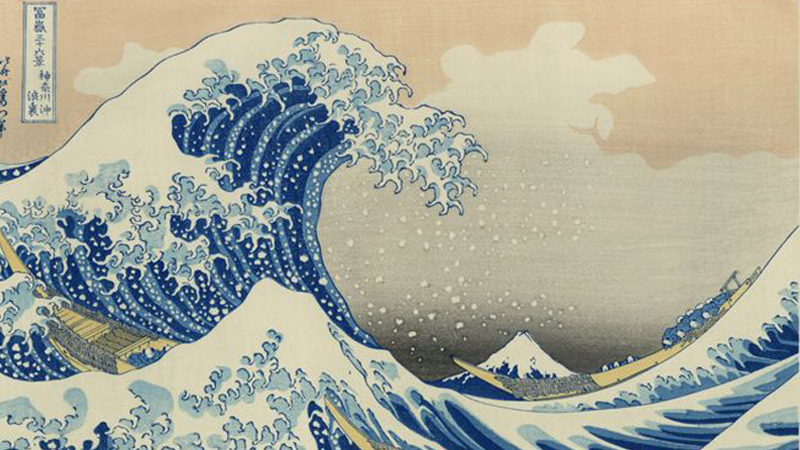 One of the major genres of Japanese art is ukiyo-e, a term that translates to "pictures of the floating world." These paintings and woodcut prints represented detailed and expansive scenes of Japanese life, from geishas and sumo wrestlers in the city to landscapes of the rural countryside and coast. This style of art correlated to the development and urbanization of Edo (now called Tokyo) under the Tokugawa shogunate. Beginning in 1603, the Tokugawa shogunate came to power and quickly reordered Japanese society into four sections. The warrior (samurai) class were at the top, while the merchants (machishu) fell to the bottom. Tokugawa's rule was characterized by isolationist policies, military order and a strong economy. Each of the four social classes were given their own neighborhoods of Edo, and the merchant area began to flourish with brothels, theaters, teahouses and sumo venues. "Floating world" or (ukiyo) was a term used to define this new society and the growth of the arts, hedonistic pleasures and concentrated city life that emerged the early 1600s. While the merchants were on the lowest rung of the Confucian-based social order, they were also the wealthiest and desired to flaunt their financial success through acquiring art, attending theaters and visiting teahouses. 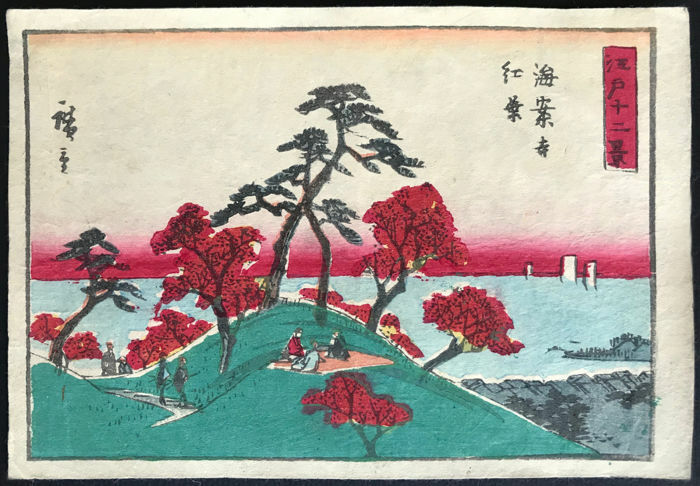 Early ukiyo-e art introduced the elements that would come to define the craft: sharply delineated forms, painted scrolls, delicate colors and depictions of contemporary city life, especially beautiful courtesans. 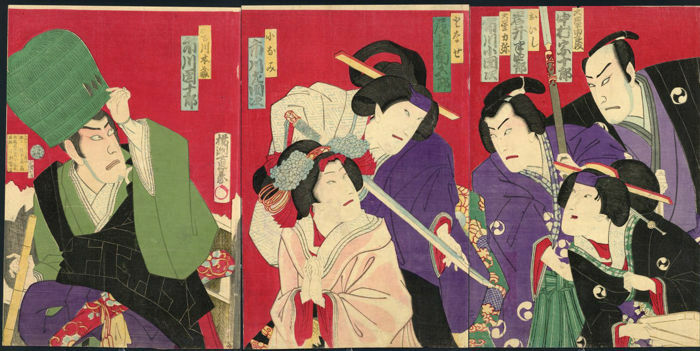 In the early 18th century, full color prints were popularized and championed by Okumura Masanobu, who was one of the leading early ukiyo-e artists and frequently depicted beautiful geishas, fierce warriors and kabuki actors. Kabuki was the dramatic theater that started in the early 1600s, featuring exaggerated makeup, elaborate costumes and often bizarre plot lines. 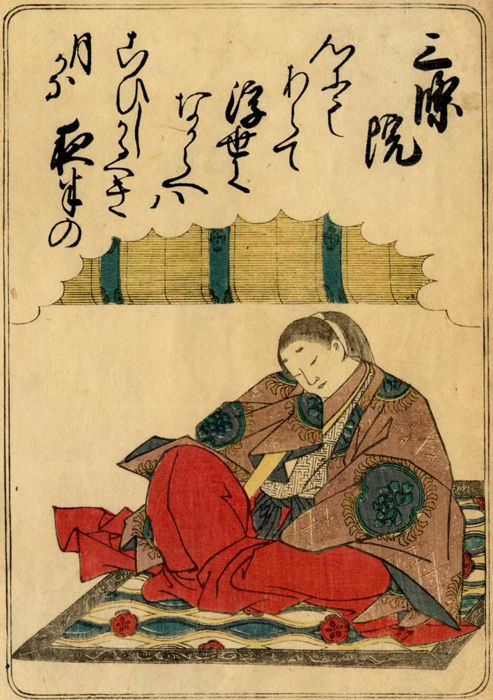 In the late 18th century, printmaker Suzuki Harunobu introduced the popular art form of nishiki-e, or brocade pictures, which were multicolored woodblock graphics known for their varied rich hues and thick paper. 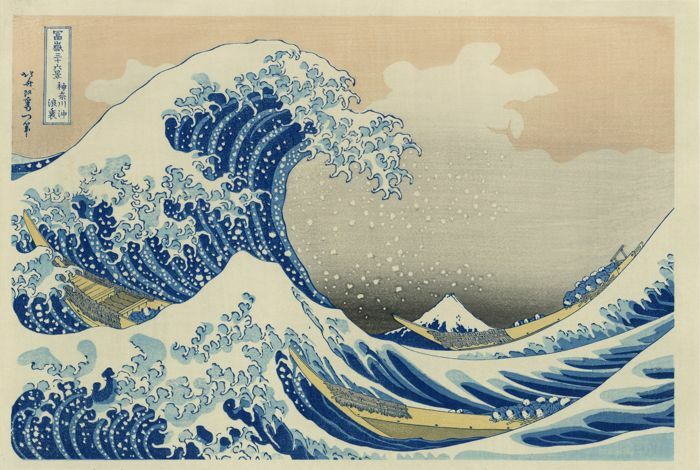 However, by the 19th century, ukiyo-e responded to the Tenpo reforms that criticized hedonism and luxury and representations of flora and fauna flourished, which is when Hokusai produced The Great Wave Off Kanagawa (c. 1829-33), the most famous work in his "36 Views of Mount Fuji" series. Hokusai was one of the best ukiyo-e artists and his work signaled a shift from portraying the leisure pursuits of the upper class to the everyday life of rural farmers and nature scenes. Hokusai was one of the great masters of ukiyo-e along with Hiroshige, who was celebrated for his landscapes and travel series. 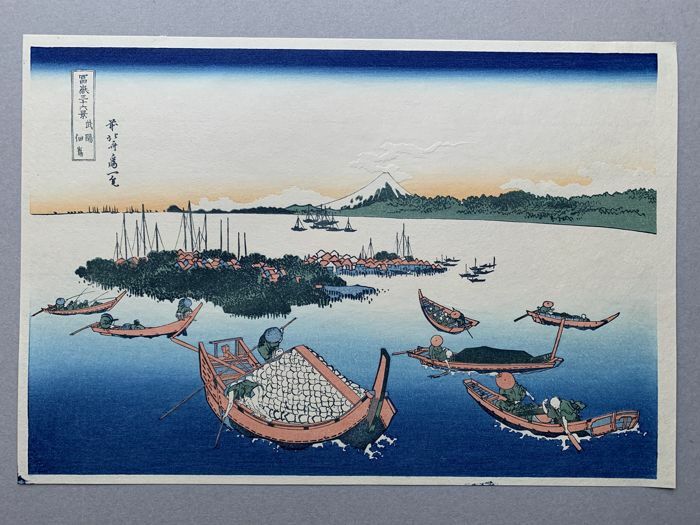 While Hokusai was more realistic and worked in sharp outlines and rich colors, Hiroshige focused more on creating soft, dream-like atmospheres with a less saturated color palette. By the late 1800s, the art changed dramatically with the deaths of the two ukiyo-e masters and the Meiji Reformation, which saw rapid Westernization and industrialization enter the island nation. By the turn of the century, ukiyo-e was considered archaic. 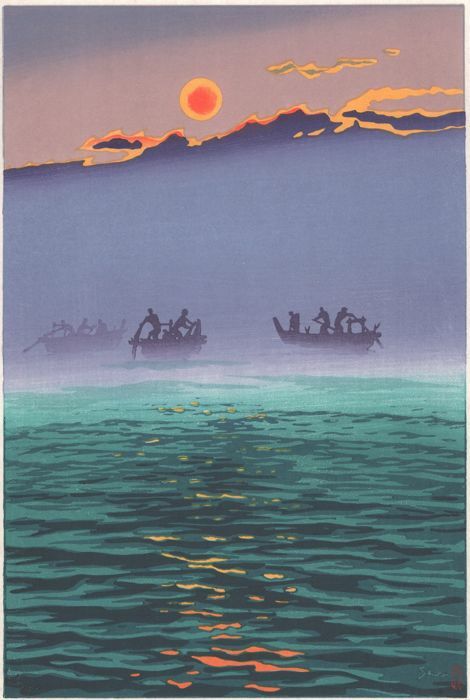 Just as ukiyo-e began declining in Japan, it became popular internationally. "Japonism" spread rapidly in the West and artists like Van Gogh, Manet and Degas incorporated elements of the style into the work, like flat shapes, outlined forms, soft colors, detailed scenes and Japanese calligraphy. 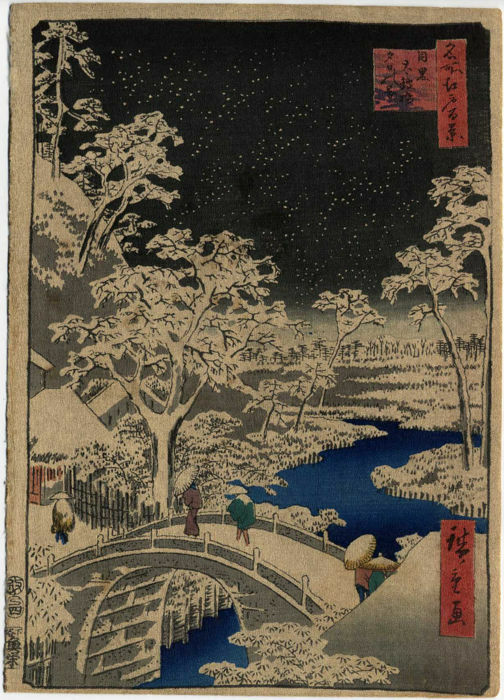 In Japan, the influence of ukiyo-e revealed itself in Japanese manga and comic books. Today, ukiyo-e can be found in major museums throughout the world and is one of the most distinct and influential styles of Japanese art. 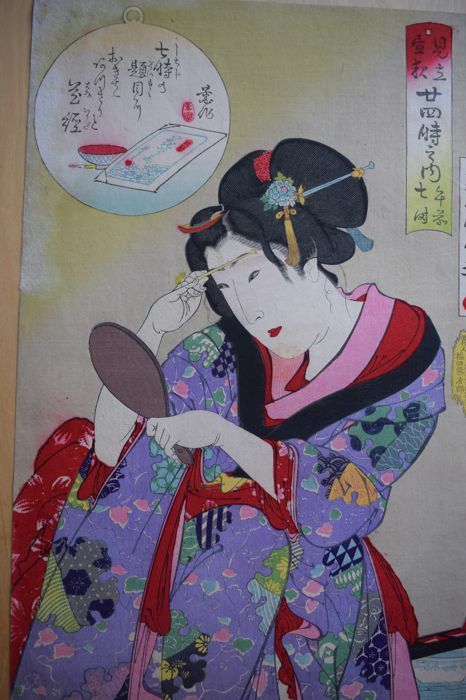 If you have ukiyo-e works to sell, here is the procedure to follow.